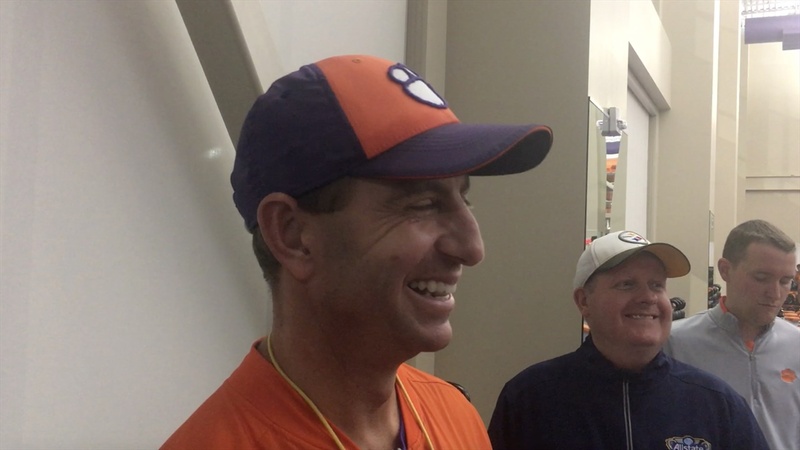 WATCH as Dabo Swinney meets with the media for the final time before Saturday's primetime matchup against Boston College. On the topic of orange britches, Swinney dove into what some of the reasons were behind adding them to the uniform combination. Said in 2009, he wanted to create some consistency with the uniforms. Where he came from (Alabama), there was no discussion about a uniform or changing things up. He felt the team wasted too much energy worrying about what they were going to wear that weekend. Now, they only wear orange pants when there is a championship on the line and purple when they honor the military. The cool part about the orange pants is that the team wore them for Swinney's first win... at Boston College. This would be the second time Clemson has worn the orange pants there under Swinney. Now, there is a division title on the line. Had some extremely positive words for Hunter Renfrow after being named one of the semifinalists for Burlsworth Award, given to the top college football player who started as a walk-on. Said Renfrow is the epitome of that award and has tried to nominate him for that award three years in a row. We asked Swinney if he sees a bit of himself in Renfrow, which he did say there were a few similar characteristics. We'll dive more into that later. Kendall Joseph has played a significant amount of fewer snaps at this point of the season as opposed to last season. Around 200 fewer snaps to be exact. Swinney said for Joseph to be able to get the work that he needs, but "keep the tread on the tire" has been vital. Venables spoke a bit about that on Monday as well given how fresh this defense has looked over the past few weeks. Injury update: Cornerback Mark Fields has looked good at practice all week and has had no setbacks. Everyone on the team should be full go. Justin Falcinelli and Matt Bockhorst, two guys who have been limited, are back and ready to go. That's it for now. Hope everyone is having a great evening out there.